Inspired by the 50 year celebration of Apollo 8's first man on the moon mission, Omega presents the Speedmaster Moonwatch chronograph model. 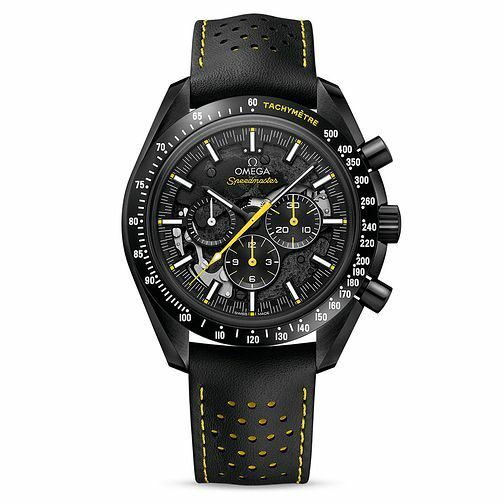 Boasting a skeletonised dial, this smart black ceramic build features yellow varnished chronograph hands, co-ordinating with the yellow detailing upon the black leather strap. The dial presents a grey design representing the craters seen on the moon, a charming design to celebrate. A prestigious brand combining flair with timekeeping precision, Omega has created iconic watches over its 150 year history.